These 'pets' have a secret - and it's totally wild! 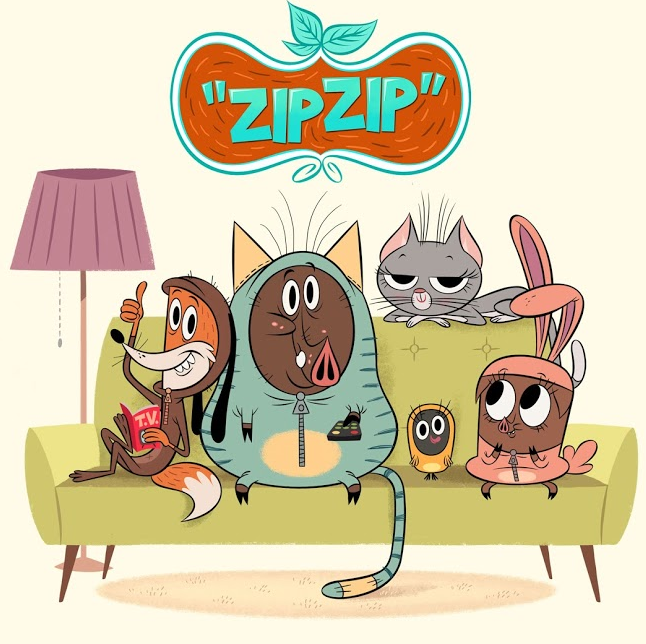 Zip Zip is a French 2D animated series from GO-N Productions, which began airing in 2015 on France 3 and is shown elsewhere on the Disney Channel. Aside from Australia, it has yet to be transmitted to English-speaking countries. Washington the fox, Sam the wild boar, his little sister Eugenie, and Suzie the blackbird have grown tired of living rough in the wilderness, and yearn for the creature comforts of the suburbs. However, they soon find animal control hot on their trail, and thanks to Wash's quick thinking, the group slip on some zip-up animal costumes so they can pass themselves off as domesticated pets. They manage to convince the Livingstones, a young animal-loving couple, to take them in, much to the chagrin of the Livingstones' housecat Victoria, who finds her pampered existence turned upside down by these impostors. Hilarity Ensues as the gang learn to adjust to suburban life whilst trying to keep their wild instincts under control in their new surroundings. Big Eater: Sam eats a lot. Well, he is a wild boar, after all. Bears Are Bad News: Mitch the bear, the gang's Jerkass neighbor from the woods and a recurring antagonist, who is one of the reasons they decided to move out. Cunning Like a Fox: Washington the fox is the animals' leader and brains of the operation. Hilarity Ensues: A lot of the show's humour derives from the animals' attempts to act like domestic creatures, all the while struggling to keep their wild instincts from being detected. Meaningful Name: Mr. Snubinski is a very snobbish human. Psychopathic Man Child: Mitch, who behaves like a six-year old and has a nasty Hair-Trigger Temper to boot. Slapstick Knows No Gender: Victoria is often the brunt of the show's physical comedy.